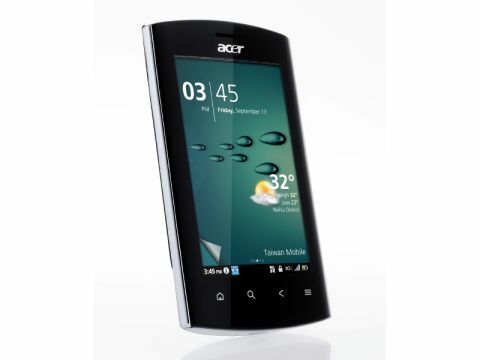 The Acer Liquid Metal shows promise, but falls over a few too many times for us to give it a big thumb's up. Acer has stuck with the same UI as the Acer Stream for the new Acer Liquid Metal, and if you hated it before, you'll probably still hate it. But the Liquid Metal costs £299 SIM free, while the Stream costs £329 as we write. The relatively low price puts the Stream on a par with the likes of the Motorola Defy, or, if you look outside the Android arena, the Nokia C7 which will set you back a little, but not a huge amount more than £299 SIM free. Unlike the Android 2.1-toting Stream, the Liquid Metal runs Android 2.2. The processor has also changed, down to 800MHz from the Stream's 1GHz. The Stream has a 3.7-inch screen, the Liquid Metal a 3.6-inch one, though both offer 800 x 480 pixels. Both have b, g and n Wi-Fi, Bluetooth, GPS and HSDPA, though the Stream tops out at 7.2Mbps download with the Liquid Metal going to 14.4Mbps. The Liquid Metal has a very different build ethic from the Stream. Where the latter was all metal-look, media buttons and sleek lines, the Liquid Metal, despite its name, is mostly plastic, chrome, and curves. Well, apart from a sliver of stainless steel on the back. The stainless steel adds some strength to the chassis, and has an etched finish that looks great. It is a deep, chocolate brown in colour and we rather like it. But it does seem very out of place when set against the sides and front of the chassis. The sides are chrome coloured, the front black. It's a mish-mash. And there's something else a bit odd about the chassis: it's curved in a couple of different ways. The back has a noticeable curvature so that it (theoretically) sits better in the hand. We can't see the point, really. It makes no difference at all to the feel of the Liquid Metal in the hand, and when you prod at the screen with the device on a desk, it rocks annoyingly from side to side. The other curve does have a purpose, and a very good one. The front of the chassis bows outwards so slightly that you'll probably not even notice it. But the curvature has the effect of making the 3.6-inch screen look somehow bigger and brighter than it has a right to. It's jolly clever. We do like the screen, actually. Though it's a smallish LCD at 3.6 inches, its 800 x 480 pixels make it able to show plenty of detail, and it's bright and vibrant. As far as the sides and front are concerned, the Liquid Metal is almost – but not entirely – conventional. Under the screen, there are four touch buttons for Android Home, Search, Back and Menu functions. On the top edge, you have the 3.5mm headset connector and on/off button. The left edge is clear, the right edge has the volume rocker and camera button, and the bottom edge has a micro-USB port. All very normal. However, on the top edge there are also three white lights, which illuminate when you have messaging notifications, missed calls, and when you're charging the battery. They show up well when it's dark, but then you might not care about the notifications at such times.